Ok, so my sewing project this weekend has taken me longer than expected. It has been so much fun though. I just love, love, love Amy Butler fabrics. Here are some pictures of my work in progress. Thanks for checking in on my blog and your kind comments. I used to live in Watertown, right next door to you. I will keep checking in on your blog and watch your progress and projects! 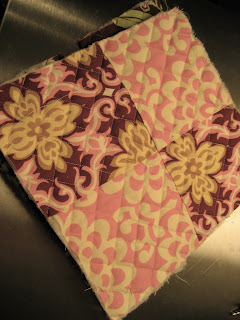 I am having a little fabric-envy issues when I visit your blog, can't wait to see what comes next. Even if I am a little on the "green" side. Thanks for visiting my blog- here is a link to the International Quilt Show schedule, but does not look like it will be in your neighborhood. But if you get the opportunity to go it is wonderful!! 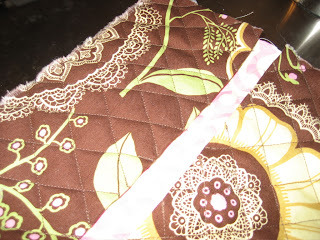 Sewing Project - Oven Mitts!